How to write an enticing Vacation Leave Letter to apply for leave to go back to your hometown? Download this sample Vacation Leave Letter template now! Depending on your job description and level of responsibility, you may want to state where you will be, whether or not you will be checking phone, WhatsApp, WeChat, or email regularly, and how you can be reached in case of work emergencies. 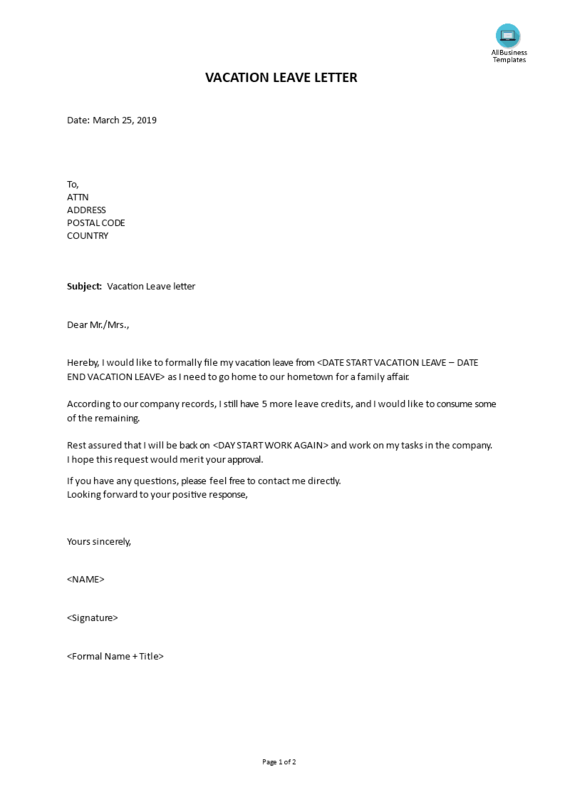 We support you by providing this sample Vacation Leave Letter template, which will save your time, cost and efforts and help you merit your leave approval. This Vacation leave letter template has ways to grab your readers' attention and able to deliver the message in a clear way. Besides, this letter is intuitive, ready-to-use and logically structured. Pay close attention to the most downloaded business, legal or life templates that will fit your needs. Download this sample Vacation Leave Letter template now!